Green plants provide a level of nutrition unparalleled among all the foods we humans eat. Green plants are foundational to life and supply the wide range of nutrients our bodies need for repair and maintenance. Life begins and ends at the cellular level. Every cell in our body requires a daily intake of vitamins, minerals, trace minerals, proteins, enzymes and dozens of other nutritional components. Even a minor deficiency of some of these nutrients can reduce the body’s ability to protect and repair itself and can manifest itself in disease. Healthy cells produce healthy tissue which in turn generates healthy organs and overall well-being. Our bodies were designed to require a broad spectrum of nutrients in order to facilitate the proper function of all body processes. These nutrients are often missing in the standard American diet which consists of processed and refined foods. Consequently, we are experiencing a great many health problems and much degenerative disease. Eating a daily portion of green foods will go a long way in preventing disease and providing the level of health we all desire. Because heating green foods destroys their enzymes, some vitamins and alters other nutritional components, eating a portion of raw greens on a daily basis will maximize the amount of nutritional benefit you receive. Greens such as romaine lettuce, spinach, kale, collards, Swiss chard, broccoli and green peppers will provide you a wide spectrum of nutrition. These greens are rich in vitamins, minerals and enzymes and have an abundance of health-promoting phytonutrients such as carotenoids (beta-carotene, lutein, and zeaxanthin) and flavonoids (proanthocyanidins and other polyphenols) which provide you with powerful antioxidant protection. Kale is considered the most nutrient dense food you can eat. Spinach has been shown to protect against prostate cancer and enhance heart health. While eating this mix of greens on a daily basis is the ideal, I know that many people just don’t have the time or will to daily put together a salad that features the variety of greens necessary to insure optimal nutritional intake. For those not able to daily eat a large salad of nutritious greens, I recommend adding a green food concentrate to your diet and virtually having your daily salad in a glass. At Milk ‘N Honey we feature a green food product called Barleylife which provides you with the nutrients found in the aforementioned green foods and a whole lot more. 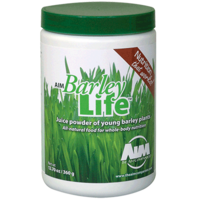 We have many customers using Barleylife and I have personally used this product for the past 24 years. Over the years we have received many unsolicited testimonials were we are told that using Barleylife on a daily basis has resulted in more energy, stronger immunity, more mental clarity and a greater sense of wellbeing.